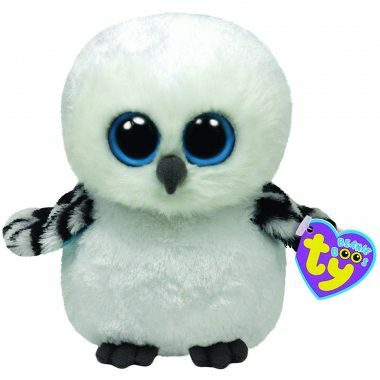 Spells is made from a fuzzy white material with large, bright blue and black button eyes and a dark grey beak. She has black markings on her wings and dark grey feet. They look so good when I take flight! Spells the Owl was introduced on 1st July 2012. Spells is based on Hedwig from the Harry Potter books and even has the same birthday as Harry Potter. This is also the same birthday as J.K. Rowling, the author of the Harry Potter books. This is the small 6″ version of Spells. She was also released as a medium 9″ Beanie Boo Buddy and as a key clip.